The writers with musical theater legend Stephen Schwartz at the 2015 ASCAP Musical Theater Workshop performance of City of Light. Molly is an organized, responsible, by-the-book young woman who lives her life by a to-do list and a plan. On the morning before her 25th birthday (also the 1-year anniversary of her father’s death,) we find Molly packing for Paris; the trip her dad had always wanted to take her on, but she never made the time. Now she plans to visit the Eiffel Tower in his honor and sprinkle his ashes. Shortly before leaving for the airport, her fiancé has to bail on their trip. Her solo trip goes immediately awry and, left with no money, ID, hotel or language skills, she must rely on her own chutzpah and the kindness of a French family to help her. A new relationship challenges her in ways she’s never experienced, bringing her to major realizations about herself and the (seemingly) perfect life she left behind in California. “City of Light” is a charming new musical of self-discovery, friendship, and listening to your heart. 6/1/13 – First staged reading, directed by Leslie Stevens, of the first draft of “City of Light” to 100+ people at ANMT in North Hollywood, CA. 12/3/13 – ANMT ( renamed NMI) produced and presented the second draft of “City of Light” at The Colony Theatre in Burbank (a 268-seat Equity house theatre). 1/26/14 – “City of Light” was selected for the full-length musical slot at PlayFest Santa Barbara, an annual new works festival in Santa Barbara, CA. PlayFest Santa Barbara produced a full concert reading, presented at the Garvin Theatre at the SBCC campus. A talk back session was held with the audience and producers after the reading. 5/10/14 – Table read of third draft held for producer (John Sparks) and director (Alison Kalmus.) A “black box” developmental workshop production was planned with the 4×10 Theatre Company, slated for September/October 2014. 9/19/14 - 10/5/14 — The workshop production ran for 3 weekends with John Sparks’ helming the 4×10 Theatre Company‘s production. Two weekends at the Beverly Hills Playhouse and one at ANMT/NMI in NoHo. 2/17/15 — Selected for ASCAP’s annual Musical Theatre Workshop with Stephen Schwartz, and presented the first 50 minutes of our show at Dreamworks to Stephen, Michael Kerker, Bill Damaschke, Susan Dietz and a theater full of people. 1/16 — Dramaturgical session with Tony-award winner Cady Huffman! 3/13/17 — Selected for the SheNYC Festival, running July 6-16 2017 in the East Village, at the Connelly Theatre, and sold out all three of our performances! City of Light was voted the festival’s Best Score and Best Ensemble. 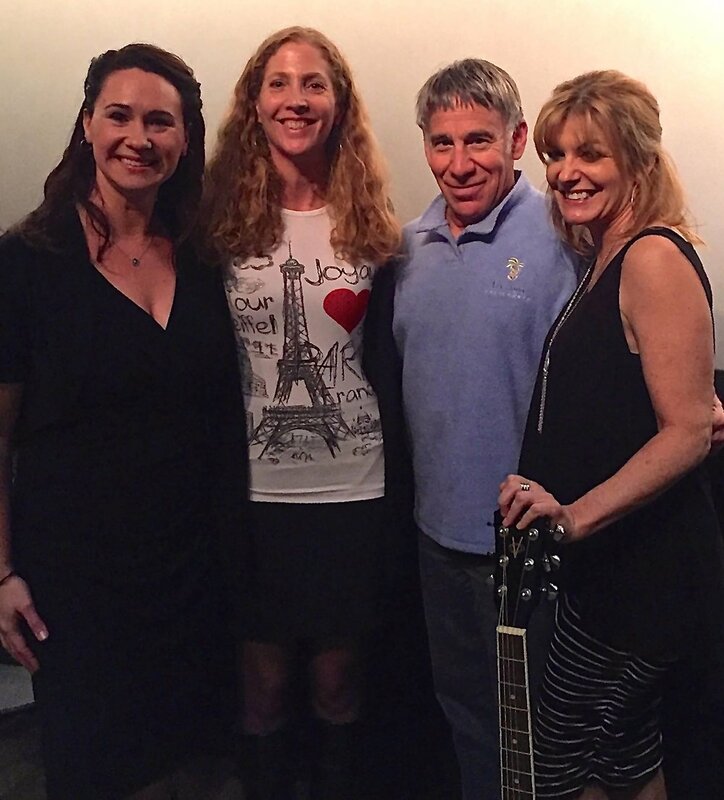 4-7-18 — City of Light’s songs featured in “Noteworthy”, an evening celebrating female theater songwriters, in support of the SheNYC festival, held at GreenRoom 42. 9-27-18 — City of Light presented in a concert reading at Feinstein’s 54 Below, and the crowd loved it!! And following the reading we are invited to participate in a new podcast featuring original musical theater work, called The Micro-Musical Show. 12-10-18 and 12-11-18 — City of Light records for The Micro-Musical Show! We had a great time with our fantastic cast at Bunker Studios in Brooklyn and at Sandblast Productions in Manhattan. Stay tuned for the podcast which will be streaming your way soon!